Acne is the most common skin problem that has a profound impact on the personal and social life of an individual. Hence, people are keen to avoid acne, especially when they find themselves more vulnerable to this condition. However, before trying any treatment method it is essential to understand that acne cannot be prevented with random magazine remedies. This feat can be achieved only with the help of a conscious and scientific acne prevention plan. It is very difficult to prevent acne as people have inadequate information about acne prevention measures. Basically, the following factors are very important when it comes to managing your problem in a scientific and systematic manner. 1. Find out the cause of acne: The best way of preventing acne is to understand the cause of this condition. Internal factors are primarily responsible for acne. One of these internal factors is hormonal imbalance. Hormonal imbalance leads to problems in the secretion of glands like the sebum oil glands. Under these conditions, the sebum glands produce excess oil which then combines with toxins and dead skin to give rise to acne. Acne can also be caused due to toxic build up. The excess toxins are expelled through the skin and combine with the sebum oil. They encourage the growth of bacteria and are therefore responsible for the formation of acne. Some people also tend to have genetically sensitive sebum glands that respond immediately to hormonal imbalance. Hence, they are more apt in producing excess oil and also encourage the build up of toxins. This lethal connection ultimately paves the way for the acne formation. 2. Follow basic hygiene: Acne is not caused by lack of hygiene. However, the problem can be aggravated if you don't follow basic hygiene. Simple things like washing your face regularly and making use of natural beauty products can do a great deal to keep it under control. 3. Avoid too much make up: Make up may enhance your looks for a few hours. However, if you are prone to acne make up can be your worst enemy. Hence, if you are used to lipsticks and foundation, see to it that you use only natural products. Avoid putting on make up for extensive period of time and remove it carefully before going to bed. 4. Follow a good diet: A diet with lots of fruits and vegetables can help in flushing out the toxins. This can prevent acne caused by toxic build up. Also, make sure to drink plenty of water and avoid the consumption of sodas and colas in its place. 5. Follow a holistic approach: Holistic approach can help you prevent acne as well as cure the existing condition into the bargain. Holistic approach is natural and safe and is extremely effective when it comes to restoring the radiance and innocence of your skin. Therefore this is the best way of preventing this skin condition. Acne prevention plan should be based only on holistic approach. This is because; holistic approach involves the use of multidimensional protocols like detoxification, cleansing, diet and lifestyle modification plan and more in order to launch an attack on this stubborn skin problem. Holistic approach is completely natural and safe and therefore causes no side effects. This unique mode of treatment is essential for preventing acne as holistic practitioners concentrate on the causes of acne and not just the symptoms. 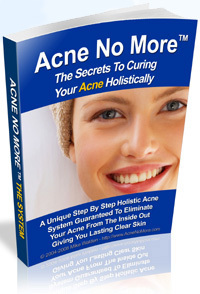 Once the internal factors of acne are fixed, acne can be cured completely. Therefore, you can eliminate and prevent acne with the help of scientific and insightful holistic approach.